Separation anxiety: Is it possible to stop the tears? Have you ever had to peel a screaming child out of your arms for a daycare or kindergarten drop off? I can tell you from first-hand experience that it’s not fun. The stress it creates for everyone is tremendous. My youngest daughter was what you would call a “spirited child”. She just felt things more intensely. Saying goodbye was one of those things. 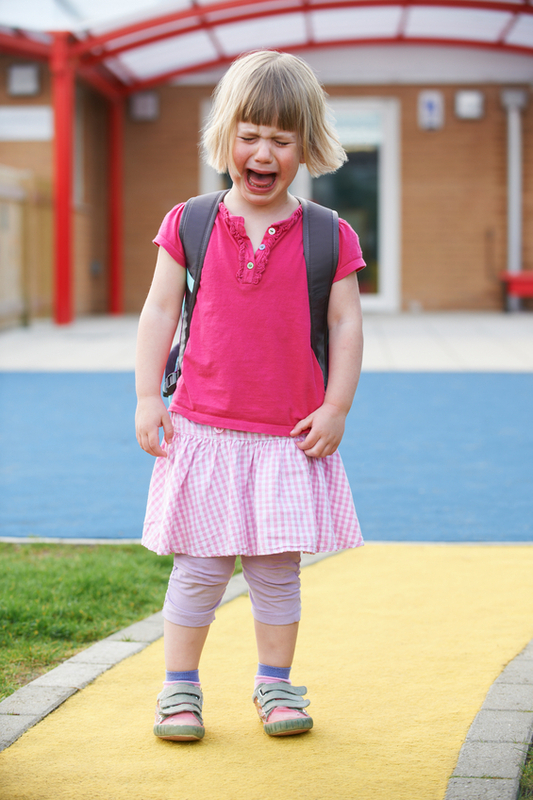 My daughter’s separation anxiety reached a peak when she started kindergarten. Her teacher and I had to literally peel her wailing, flailing body off of mine when the school bell rang. All eyes were on us in that little fenced-off area for kindergarten kids. As I left the school yard with her screams echoing in my ears, pangs of guilt washed over me. I carried a feeling of worry with me all day. It was not the joyful start to school I had imagined. Create a leaving routine. Keep it simple and short. We had a hug, a kiss on her cheek and one on her hand. Secret handshakes, high fives or special signals are also great. Leave promptly. Don’t hesitate or linger. Be confident yourself. Try your best not to show your own guilt or anxiety. I know this is easier said than done, but your child feels your emotions, so show confidence. Never sneak away, that will break the bond of trust between you and your child. Let children take a transition object. I laminated a family picture for my daughter to keep in her backpack so she could feel we were always nearby. A favourite toy or stuffed animal can be comforting during this time too. Create a reuniting routine. How you come back together at the end of the day is important too. Greet your child with a smile on your face. Ask them about their day. Keep it positive. I used to ask my daughter to share two great things that happened at school and made time to connect and snuggle together before we moved on to other tasks or activities. Praise them for conquering their fears! Acknowledge every little act of bravery. Tell them how proud you are of their efforts and celebrate the successes. There are many great children’s books out there that are helpful to read before starting school. My absolute favourite (that still makes me well up with tears) is The Kissing Hand by Audrey Penn. Check out your local library and ask your librarian for more recommendations. It wasn’t until after Thanksgiving that my daughter started to willingly go into the classroom without tears. It took a lot of patience and extra love and attention during this adjustment to kindergarten. I am happy to report that this same girl started university last fall and very confidently waved goodbye from her residence dorm room as I bravely said “you’ve got this” and then escaped to my car where I could burst into tears. I guess the emotions around separation and saying goodbye are around for many years. How about you? What is your experience with separation anxiety? Please tell us your story. Parenting and supporting families to be as healthy as possible is my passion. I love opportunities to connect with Halton families on social media and look forward to chatting with you online. Halton Region is where my family lives and plays. This entry was posted in Parenting, Parenting Your Toddler & Preschooler, Play, Growth & Development, Preparing for Kindergarten, Toddlers & Preschoolers and tagged anxiety, attachment, attachment parenting, childcare, daycare, Full day kindergarten, Preparing for Kindergarten, preschoolers, saying goodbye, separation anxiety, Starting kindergarten, starting school, teachers, Toddlers & Preschoolers. Bookmark the permalink. 4 Responses to Separation anxiety: Is it possible to stop the tears? I just started crying while reading the part about how your daughter waved good-bye from university! Great piece, I will need this advice for my youngest daughter who is also “spirited”. My eldest starts JK this fall and although she is more of an extrovert and loved going to preschool, I feel like I am going to have separation anxiety myself! Awe, I’m so glad you felt an emotional connection to this blog! Time flies, I feel like it was just yesterday I was sending her to JK. Sniff, sniff. And you are so right, as a parent it can be us that have separation anxiety, and that’s okay. Most important thing is to be aware of it and do all you can to show confidence and excitement when they start school. I found it helpful to keep my days really busy during those first days of school, it kept my mind busy and helped the day fly by. Good luck to you in September!